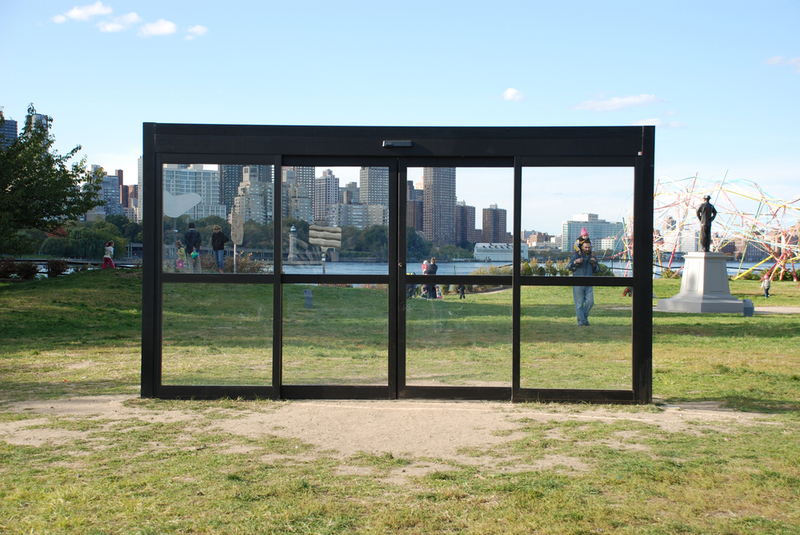 A pair of everyday sliding automatic doors were installed in the middle of Socrates Sculpture Park in Long Island City. With allusions to minimalist sculpture, consumerism, a nod to the dichotomy of desire, and the contradictions of barriers and fences, the project suggests a barrier made of typical storefront glass walls. In this case, it is a useless barrier as the doors open automatically when someone walks up or even just around them. It provides instead a moment of pause as one passes over the threshold to view the city skyline across the East River. With Osman Khan. Horton bi-part sliding automatic door.